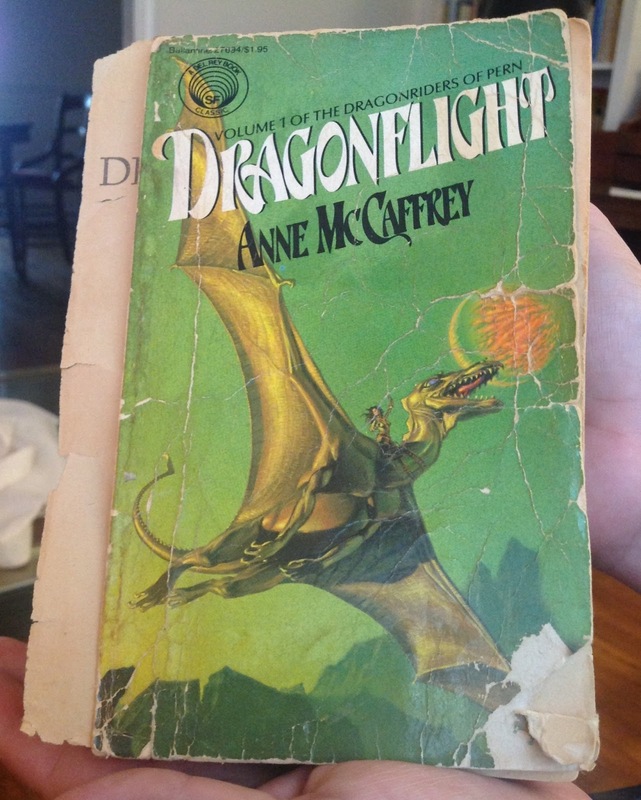 Which is the very copy of Dragonflight (1968) I read as a 12 year old, and obviously re-read many, as did my mother. It's the first book in McCaffrey's Dragon Rider series, and is a sci fi classic (really sci fi, not fantasy, despite what "dragons" suggests). Pern is a planet ravaged every two hundred years by devouring Thread (bad acid stuff that burns any living thing it touches) that falls from space. To fight Thread, the people on the planet fly around on fire-breathing dragons, torching it with fiery dragon breath as it falls. The dragons are psychically bonded with their riders, and the newest rider of the last remaining queen dragon is a young woman named Lessa (and her particular story is long and complicated....). Dragonflight is primarily about the dragon riders fighting the latest round of Threadfall, with Lessa and her consort, F'lar, doing their best with the few dragons who remain. Things are pretty grim-- two extra centuries had passed before Thread came again, and only one stronghold of dragons is still there to take to the skies. Lessa wants to fight directly, but hers is the last queen, too precious to be risked. It's all Lessa can do to learn to fly...and when she finally gets the chance to teleport, she discovers that dragons can journey not only through space, but through time as well. And this new found ability proves to be the key to saving the planet. Looking back at it after all these years, I am still completely impressed by the wonderfully imaginative concept, and the extraordinary sense McCaffrey give the reader of really being in a strange and different place. Her characters (in these early books of the series at least) are very real and dear to me, and though it's not hard to find small flaws in the writing, and wince at the sexist society, these issues weren't enough to ever spoil my enjoyment (especially since Lessa is a strong, not taking anything from anybody, character....). It is also a fascinating time travel story. The world building takes so very much the center stage that the time travel, although utterly crucial to the plot, is overshadowed, but it is truly Solid, pointful time travel--an ability is found, and put to use to save the day through a nicely developed learning process. Which is to say, it's not a deus ex machina, but something that is scary, confusing, to be carefully considered, to be used in desperation, regardless of unknown risks. In short, the way the time travel is carried out is pretty believable. It's also the only time travel book I can think of in which living creatures are the key through which people can travel through time. There are other books with time traveling creatures, but none that rely on the symbiotic psychic bond of human and non-human person to make the time travel happen. In short, I'll be getting my mother a new copy of Dragonflight. The copy shown above fell apart in my hands pretty irrevocably, and she might well want to read it again....and me too. I read the Harper Hall series when I was young and really liked it, and I've tried other McCaffrey series, but I'd never picked up this one until last summer. I winced too often (in my opinion) at some of the un-PC bits, and put it down about 3/4 through. You make me want to get it out of the library and try one more time. I love Anne McCaffrey, although strangely I haven't read any of the Pern books yet. I discovered the Crystal Singer trilogy when I was in high school, and the books remain some of my favorites to this day. The thing with Pern is that the first four books published are very readable indeed...but then things go down hill and get rather patchy. But worth trying, especially the first two Harper Hall books! Crystal Singer is another one I read to bits. I loved the early dragon books. With most of her series, the first two-three are really good and then after that it grows increasingly uneven. Fortunately, Pern has several series! I read those, sooo many times when I was growing up. I've been a little scared to pick them up again. This is by far my favourite McCaffrey book (keeping in mind I've only read bits and pieces of her Pern and Harper Hall series). Like you, some of it is probably because I read it when I was young (and reread and reread haha). I've read the next 4 or so books in the series and even the first couple after Dragonfligh I just couldn't get as invested in. I think we had multiple copies of this fall apart in my parents' house, too... I have to agree on the sexism, which I hadn't noticed as a 10-year-old but was glaringly obvious when I went back in college. And yet I still love it! Oh, I love Dragonflight--apart from the sexism, which I see was mentioned in the comments. But I read this around the age of 12 too, and I can't help but loving the characters and the world...though my favorites are the Harper Hall Trilogy! I love this one! I think I first read the Pern books around age 12 too. So great!